Here’s some Friday Fun to get your brain warmed up for summer classes! 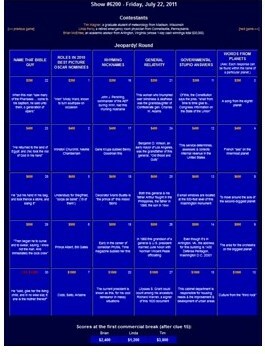 Test your trivia mastery with a “fan-created” collection of Jeopardy!® game show questions called the J! Archive. Start by selecting a season by number on the home page, then select a specific show from the list of show numbers (also displayed are the date that it aired and the names of the contestants). Once you’ve made a selection, you’ll see the clues board for all three rounds and the results for the contestants after each round. Hover on the dollar value of a clue and you’ll see the correct response, as well as any incorrect responses the contestants made. It’ll even tell you if it stumped all three contestants. This entry was posted in around the world and tagged fun stuff, game shows, trivia, web sites. Bookmark the permalink.